The Housing Enforcers Catch Up? Consumer programme. Matt Allwright joins the ranks of Britain's housing officers. 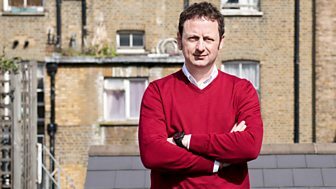 Matt Allwright visits an overcrowded property where lives are at risk, and talks become heated on a street when antisocial behaviour is tackled. Matt Allwright meets a mother and child living in such cramped conditions her husband has to sleep on the floor, and a visually impaired couple get help to live independently. A family living off-grid are helped to stay in their remote home, and Matt Allwright meets the ex-serviceman whose rented house is so damp it has started sprouting mushrooms. Matt Allwright visits a converted house whose landlord isn't playing by the rules, and housing officers smell a rat in a crumbling property. Matt is in Newham where he meets two families living a little too close for comfort. Consumer programme. Matt Allwright teams up with a housing officer in Sandwell whose neglected property leaves us smelling a rat. Matt visits a household where the landlady's post-it notes have become a sticking point. In the Lake District, officers inspect the empire of a landlord king.